I have to thank my daughter-in-law (Juicy Health Company) for sharing this wonderful recipe from Natasha Corrett at Honestly Healthy. My husband, who very willingly goes grocery shopping for me sometimes, quite often gets the quantities wrong and when I asked for one mango recently, I ended up with one boxful – 10 mangoes!! I gave a few to my daughter-in-law and hence this superb recipe appeared. I didn’t have any red shallots so I used a white onion instead. This deliciously fruity, tangy salad was a lovely side dish to serve along with the chicken I cooked for my Cloud Bap burgers. I had a lovely bowl of roasted chopped cashews but only remembered to sprinkle them on after dishing up the salad (and taking the pictures) ! I also copied my d-in-law and served the salad on a bed of rice noodles. What a combination – absolutely divine. 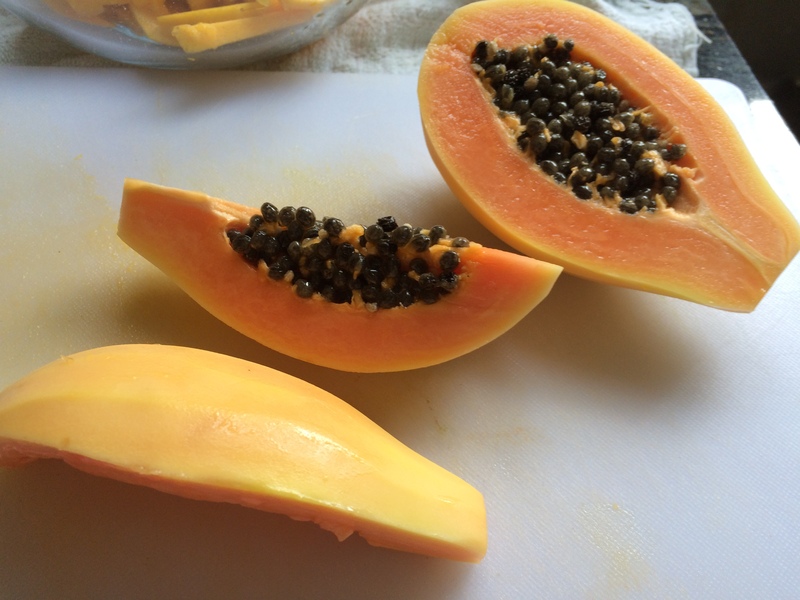 Julienne the raw papaya and mango and place in a bowl. Prepare the dressing by thinly slicing the shallot, lemon grass, ginger, chilli and garlic and add to the fruit in the bowl. Mix the vinegar, agave and lime juice together and pour over the top of the fruit. Mix in the coriander and serve with a garnish of toasted cashews. This very tasty recipe was ample for two servings and would compliment many dishes. 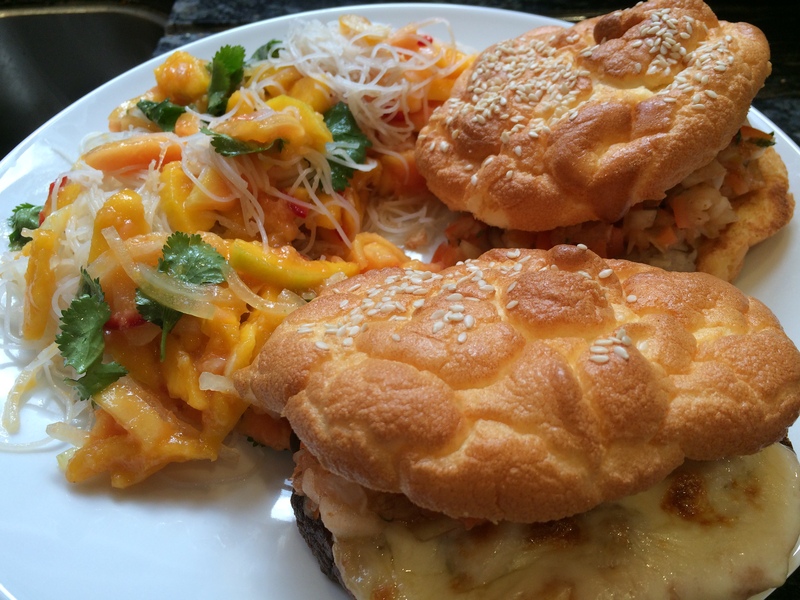 I served it with my Cloud Bap Chicken Burgers but it would be a lovely salad to have just on its own. NB: All the photographs used in this blog have been taken by me, and are of food I have prepared myself. 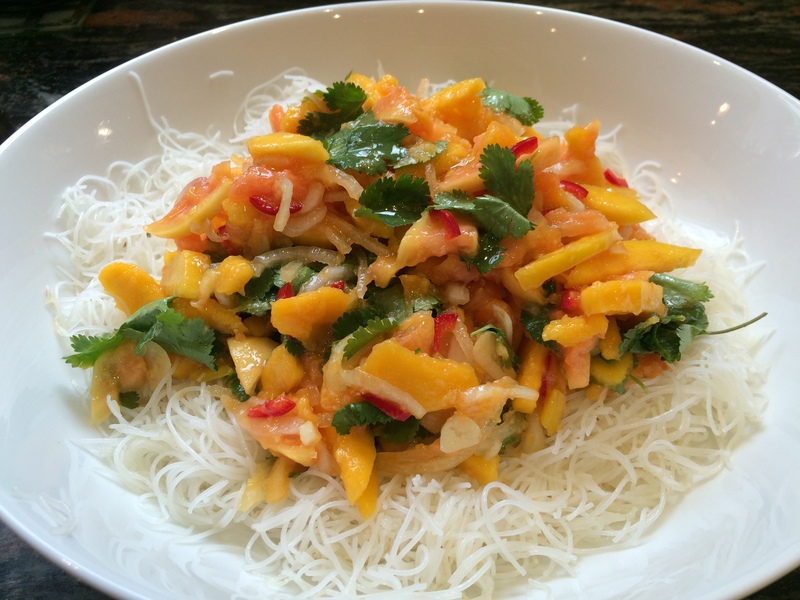 This entry was posted in Salads and tagged Cashews, Coriander, Mango, Papaya, Salad. Bookmark the permalink.